At 1200 on February 21, 1945, Flight Chief Petty Officer Mitsuhiro Maki took off from Hachijōjima Airfield in a Suisei Dive Bomber (Allied code name of Judy) loaded with a 500-kg bomb. He was a member of the Kamikaze Special Attack Corps 2nd Mitate Squadron. He died in a special (suicide) attack off Iwo Jima at the age of 21. He was from Kagoshima Prefecture and was a member of the 16th Otsu Class of the Navy's Yokaren (Preparatory Flight Training Program). Tomorrow finally I will make a sortie as a Special Attack Corps member. I truly thank you for taking care of me for a long time. I imagine in my mind Grandfather, Father, Mother, Older Sister, and Younger Brothers. Now it is 11:10 in the evening. Even though I die, please do not be upset at all. Being assured of joy with our family honor, I will go and die smiling. It is absolutely unnecessary to worry about me. This time comes once for all humans. Air attacks on the mainland have become fierce, and we are suffering from air attacks from the enemy task force with its material superiority. Since I am prepared, it does not surprise me. All of us desire to make a special attack. I regret only that I was not able to do any act of filial piety, but please forgive me to perform my loyalty to the Emperor and my filial piety together since tomorrow I surely will stab swords together with an enemy ship and sink it instantly. The cold also is at its peak, so please take good care of yourselves and live a long life. Please give my warm regards to those persons in Korea and Jōkawauchi  and all of the neighbors. Sueyoshi and Michiharu, both of you do your best. Shigenori also will do well. Farewell. The letter and poem come from Matsugi (1971, 172-3). 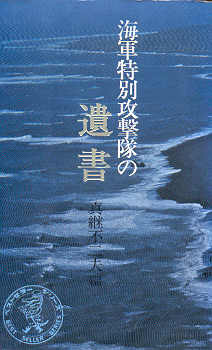 The biographical information in the first paragraph comes from Matsugi (1971, 172) and Osuo (2005, 227). 1. Jōkawauchi is a district on Nagashima Island near Izumi City in Kagoshima Prefecture.